This list is limited to unmodified production cars which meet the eligibility criteria below. All entries must be able to be verified from reliable sources. Because of the inconsistencies with the various definitions of production cars, dubious claims by manufacturers and self-interest groups, and inconsistent or changing application of the definitions, this list has a defined set of requirements. For further explanation of how these were arrived at see the above links. Being street-legal in their intended markets and capable of passing any official tests or inspections required to be granted this status. For the purpose of manageability, this list is limited to production cars that are able to reach 0–100 km/h time or 0–60 mph (0–97 km/h) in 3.0 seconds or less for the first list or cover a quarter mile (402 m) from a standing start in 11.0 seconds or less for the second list. If an independent time becomes available, that time will be listed over the manufacturer's time regardless if the latter is quicker. Many elements change how fast the car can accelerate to 60 miles per hour (97 km/h). Tires, elevation above sea level, weight of the driver, equipment used for testing, weather conditions and surface of testing track all play a big part in these times. Some measurements exclude the first foot-rollout. Most cars are 2-seaters, although a few are family-sized. ^ a b Some measurements exclude an initial "rollout", which according to Car and Driver "can affect the elapsed time by as much as 0.3 second". Furthermore, environmental conditions change how fast the car drives (tires, surface of testing track, elevation above sea level, weight of the driver, and equipment used for testing are all critical). Times sourced for example by Car and Driver, are modified artificially using computer software after the drive test is complete, to theoretically account for how the car would have performed differently given different weather conditions. ^ a b Car models similar to an already mentioned model but differentiated only by minor package options (for example "convertible editions") are omitted acknowledging that speed results with those editions can be only slightly less fast. In the case of a tie between two cars, since there exist a variety of different opinions regarding the interpretation of, for example, 1/4 mile trap speed results, the car shown first is the one with the earlier model year (of the fast time's represented model, and not necessarily of any driven car) or if both years are the same it goes to the car having the earliest date associated with the performance data's verification or publishing. ^ a b This is the earliest model year of the car that can claim all its following listed data. This is not necessarily the model year of any driven car, the year when testing was performed, the year during which owners took first delivery of the model, the year it was unveiled, or when it was built. ^ a b This is the fastest result provided by independent sources or the manufacturer. ^ This is the fastest result provided by independent sources. ^ This is the result shown by the manufacturer. ^ a b These cars usually have, unless otherwise stated, some combination of 2 seats and a forced induction gasoline mid-engine. Some are produced in limited number (associated with an increase in value), and those limited production numbers, if any, are stated. ^ a b c Tesla vehicles don’t have traditional model years per se in the sense of design revisions being pushed out annually. For Tesla, the "model year" of any given car is the same as the calendar year that the car was produced but changes and updates, both in hardware and software, are pushed out whenever they are deemed ready. That said, for the purposes of this list, the "earliest model year of the car that can claim all its following listed data" (as per the note at the top of the "Year" column) is technically 2016 for the Model S P100D and the Model X P100D since that is when the 100kWh battery option was introduced even though the software update that made it possible to achieve the times currently listed was only released in 2017. All instances of the Model S P100D and Model X P100D are capable of claiming all their respective listed data if their software are updated to at least the revision which includes the "Ludicrous+" code. No modification by either professional tuners or individuals is necessary. ^ Dodge didn't allow independent magazine testers to use their own measuring equipment, the best Road & Track could get was 2.6 seconds to 60 mph measured with an app from inside the test car. ^ 2.1 sec claimed if rollout is included. ^ a b Ferrari didn't allow standard tests on neutral ground for the LaFerrari, the acceleration numbers in the magazines were obtained downhill on the Ferrari test track with a specially prepared car on Ferrari's terms. Motor Trend´s LaFerrari report published a 9.7 second 1/4 mile only after each 9.9 second result was rewritten to account for weather, and it also revealed that standard car tests performed by Motor Trend involve multiple runs, driving forward in both directions to then compute averages, stating, "Fiorano’s downhill front straight was the only place we were allowed to do acceleration runs, and we couldn’t run backward for a two-way average. The data shows the fastest quarter-mile run declining by 18.2 feet from start to finish, or 1.4 percent. For reference, the National Hot Rod Association allows a 1.0 percent maximum grade over the course of a quarter mile. It’s difficult to say how much of an advantage this gives the LaFerrari, but it helps enough that we’ll asterisk these results until we can test a car on level ground". 11.03 sec @ 141.75 mph were measured on neutral ground. ^ Pre-production, prepared dragstrip, 100-octane fuel. Time factory driven one year before production start. Dodge didn't allow independent magazine testers to use their own measuring equipment or turn on dragstrip timers, the best Road & Track could get was 2.6 seconds to 60 mph and 10.7 for the quarter-mile, Motor Trend got 11.0 as best time self-reported from the car. ^ Standard Pirelli PZero Corsa tyres. ^ a b Webster, Larry (May 2005). "The Importance of 'Rollout' - Feature - Car and Driver". caranddriver.com. Archived from the original on 28 April 2016. Retrieved 21 April 2016. ^ a b Webster, Larry (May 2005). "Correcting for Weather - Feature - Car and Driver". caranddriver.com. Retrieved 12 April 2016. ^ a b Colwell, K.C. (15 May 2014). "2015-porsche-918-spyder-feature-car-and-driver2015-porsche-918-spyder.pdf" (PDF). caranddriver.com. Retrieved 11 April 2016. ^ a b Colwell, K.C. (July 2014). "The 2015 Porsche 918 Spyder Is the Quickest Road Car in the World – Feature – Car and Driver". caranddriver.com. Retrieved 11 April 2016. ^ "Tech-Specs-2015-Porsche-918-Spyder.pdf" (PDF). porsche.com. Retrieved 11 April 2016. ^ Feder, Joel (20 April 2017). "Dodge Demon can actually do 0-60 mph in 2.1 seconds, but there's a catch". Motor Authority. US. Retrieved 30 September 2018. ^ Brantley, Brian (7 February 2017). "2017 TESLA MODEL S P100D FIRST TEST: A NEW RECORD — 0-60 MPH IN 2.28 SECONDS!". motortrend.com. Retrieved 7 February 2017. ^ a b "Elon Musk on Twitter: "New rev for Autopilot HW2 rolling out Mon to first 1000 & to rest of fleet in shadow mode. Also improves HW1 and enables Ludicrous+."". twitter.com. 8 January 2017. Retrieved 11 January 2017. ^ a b "Elon Musk on Twitter: "Looks like the Model S P100D Easter egg will allow it to do 0 to 60 mph in 2.4 sec and a 10.6 sec 1/4 mile via software update next month"". twitter.com. 16 November 2016. Retrieved 11 January 2017. ^ "Introduction to the Ariel Atom". North America: Ariel. Retrieved 15 October 2018. ^ Marriage, Ollie (6 September 2010). "Ariel Atom 500 V8". Evo. UK. Retrieved 30 September 2018. ^ "History". Ariel Motor Co. Retrieved 15 October 2018. ^ "2018 Dodge Challenger SRT Demon Review - Dodge Demon First Drive". Roadandtrack.com. 19 July 2017. Retrieved 7 April 2018. ^ "Dodge Demon can actually do 0-60 mph in 2.1 seconds, but there's a catch". ^ Hunkins, Johnny (11 April 2017). "It's Here! EVERY Detail On The 9-Second Dodge SRT Demon!". Hot Rod Network. US. Retrieved 17 November 2017. ^ "2018 DODGE CHALLENGER SRT DEMON FIRST DRIVE". Motor Trend. Retrieved 19 December 2017. ^ a b "2018 Lamborghini Huracan Performante Test". Car and Driver. Retrieved 23 February 2018. ^ "Lamborghini Huracán Performante". www.lamborghini.com. Retrieved 23 February 2018. ^ a b c Evans, Scott (15 February 2016). "2017 Lamborghini Aventador S—Can a Bull Rage in a Land Without Curves?". youtube.com. Retrieved 10 October 2017. ^ "Lamborghini Aventador LP 750-4 Superveloce: technical specifications". lamborghini.com. Retrieved 1 May 2016. ^ a b Lago, Carlos (20 April 2015). "Ferrari LaFerrari First Test - Motor Trend". motortrend.com. Retrieved 20 April 2016. ^ a b "2015 Ferrari La Ferrari: Tested! The New Production Car Record Holder? - Ignition Ep. 132". Motor Trend. 18 May 2015. Retrieved 20 April 2016 – via youtube.com. ^ a b Davies, Steve (26 January 2016). "Judgement Day for the Holy Trinity: McLaren P1 vs Porsche 918 Spyder vs LaFerrari (w/VIDEOS)". skiddmark.com. Retrieved 7 February 2017. ^ Nunez, Alex (31 March 2015). "We tested the LaFerrari, and the numbers are ridiculous". roadandtrack.com. Retrieved 20 April 2016. ^ "Ferrari LaFerrari: First Hybrid with 963 CV - Ferrari.com". ferrari.com. Retrieved 12 April 2016. ^ "2018 Bugatti Chiron Review @ Top Speed". Top Speed. ^ a b Phillips, John (December 2008). "Bugatti Veyron 16.4 - Road Test - Car Reviews - Car and Driver". caranddriver.com. Retrieved 23 April 2016. ^ Elfalan, Jonathan (6 September 2011). "Two Second Club Road Test – Bugatti Veyron Super Sport, Porsche 911 Turbo S, Nissan GT-R". roadandtrack.com. Retrieved 23 April 2016. ^ "Adobe Photoshop PDF - Technical_Specifications_Bugatti_Veyron_16.4.pdf" (PDF). bugatti.com. Archived from the original (PDF) on 31 July 2016. Retrieved 23 April 2016. ^ a b "Adobe Photoshop PDF - Technical_Specifications_Bugatti_Veyron_16.4_Super_Sport.pdf" (PDF). bugatti.com. Archived from the original (PDF) on 14 October 2015. Retrieved 23 April 2016. ^ a b Pund, Daniel (February 2016). "2017 Porsche 911 Turbo / Turbo S First Drive – Review – Car and Driver". caranddriver.com. Retrieved 18 April 2016. ^ Quiroga, Tony (March 2015). "2015 Chevrolet Corvette Z06 vs. 2015 Nissan GT-R NISMO, 2014 Porsche 911 Turbo S Comparison Tests - Page 3 - Car and Driver". caranddriver.com. Retrieved 18 April 2016. ^ "Porsche The new 911 Turbo S - Technical Specs - Porsche Cars North America". porsche.com. Retrieved 18 April 2016. ^ "The McLaren 720S Can Run 9s in the Quarter-Mile". Roadandtrack.com. 16 October 2017. Retrieved 7 April 2018. ^ "McLaren Super Series - 720S - Specification". Cars.mclaren.com. Retrieved 7 April 2018. ^ a b Tingwall, Eric (August 2014). "2015 Lamborghini Huracán LP610-4 Tested – Review – Car and Driver". motortrend.com. Retrieved 21 June 2016. ^ "Lamborghini Huracán Technical Specifications". lamborghini.com. Retrieved 30 April 2016. ^ Seabaugh, Christian (28 October 2015). "2015 Tesla Model S P90D w/Ludicrous Upgrade First Test". motortrend.com. Retrieved 29 April 2016. ^ a b "Three Dog Day". tesla.com. 17 July 2015. Retrieved 11 January 2017. ^ a b Lago, Carlos (13 March 2014). "McLaren P1: How I Set The Motor Trend Production-Car Record - Motor Trend". motortrend.com. Retrieved 12 April 2016. ^ "McLaren Automotive - McLaren P1 - Specification". mclaren.com. Retrieved 12 April 2016. ^ a b Lieberman, Jonny (28 October 2015). "2017 Audi R8 V10 Plus First Test Review". motortrend.com. Retrieved 29 April 2016. ^ "2017 Audi R8 Coupe: Price - Engine - Specs". audiusa.com. Retrieved 13 April 2016. ^ a b Lieberman, Jonny (16 April 2012). "2013 Nissan GT-R Black Edition vs. 2012 Porsche 911 Turbo S Comparison - Motor Trend". motortrend.com. Retrieved 24 April 2016. ^ "Porsche 911 Turbo S". porsche.com. January 2018. Retrieved 22 January 2018. ^ Ivanov, Victor (26 April 2012). "2013 Nissan GT-R R35 - 10.87 seconds at 1/4 Mile with 201 km/h". automobilesreview.com. Retrieved 15 April 2016. ^ a b Lyon, Peter (23 November 2011). "First Drive: 2013 Nissan GT-R Track Pack Japanese Spec - Motor Trend". motortrend.ca. Retrieved 15 April 2016. ^ a b Kim, Calvin (12 March 2012). "2012 Lamborghini Aventador LP700-4 Road Test – Lambo Aventador Test – RoadandTrack.com". roadandtrack.com. Retrieved 1 May 2016. ^ "Lamborghini Aventador LP 700-4: technical specifications". lamborghini.com. Retrieved 1 May 2016. ^ a b Warner, Robin; Kierstein, Alex (15 July 2015). "We Tested the McLaren 650S and the Results are Incredible". roadandtrack.com. Retrieved 11 April 2016. ^ "McLaren-650S-Spec.pdf" (PDF). mclaren.com. Retrieved 11 April 2016. ^ a b Robinson, Aaron (April 2015). "2016 Acura NSX Dissected: Powertrain, Chassis, and More – Feature – Car and Driver". caranddriver.com. Retrieved 15 April 2016. ^ Revolta, Doug (30 October 2015). "2016 Honda NSX - full spec, details, pictures - What Car?". whatcar.com. Retrieved 15 April 2016. ^ a b Road, The; Staff, Track (20 November 2018). "Complete Results From Our 2019 Road & Track Performance Car of the Year Testing". Road & Track. US. Retrieved 12 December 2018. ^ Prior, Matt (March 2014). "Caterham Seven 620R review". autocar.co.uk. Retrieved 22 May 2018. ^ "Seven 620 R". us.caterhamcars.com. Caterham Cars. Retrieved 22 May 2018. ^ Lofthouse, Andrew (23 January 2015). "BAC Mono news, review, test drive and photos". autoweek.com. Retrieved 20 April 2016. ^ "Discover Mono - Specifications". bac-mono.com. Retrieved 20 April 2016. ^ Hanley, Steve (1 December 2015). "Performance Gains after P85D Ludicrous Mode Upgrade". teslarati.com. Retrieved 11 January 2017. ^ "How quick is Tesla Model X P100D Ludicrous? 0-60 mph Max Power Launch! vs No Launch". youtube.com. classicalmucia1an. 20 October 2016. Retrieved 16 December 2016. ^ "Elon Musk on Twitter: "Model X numbers should also improve by 0.1 sec on 0 to 60 and 1/4 mile"". twitter.com. 16 November 2016. Retrieved 11 January 2017. ^ a b Quiroga, Tony (February 2018). "2018 BMW M5 Test | Review | Car and Driver". caranddriver.com. Retrieved 14 February 2018. ^ "The BMW M5 – High Adrenaline Sedan – BMW USA". bmwusa.com. Retrieved 14 February 2017. ^ a b Colwell, K.C. (December 2018). "Ferrari 812 Superfast, the Literally Named Supercar". Car and Driver. US. Retrieved 12 December 2018. ^ "Ferrari F12tdf: Track-Level Performance on the Road". ferrari.com. Retrieved 11 April 2016. ^ a b Austin, Michael (July 2011). 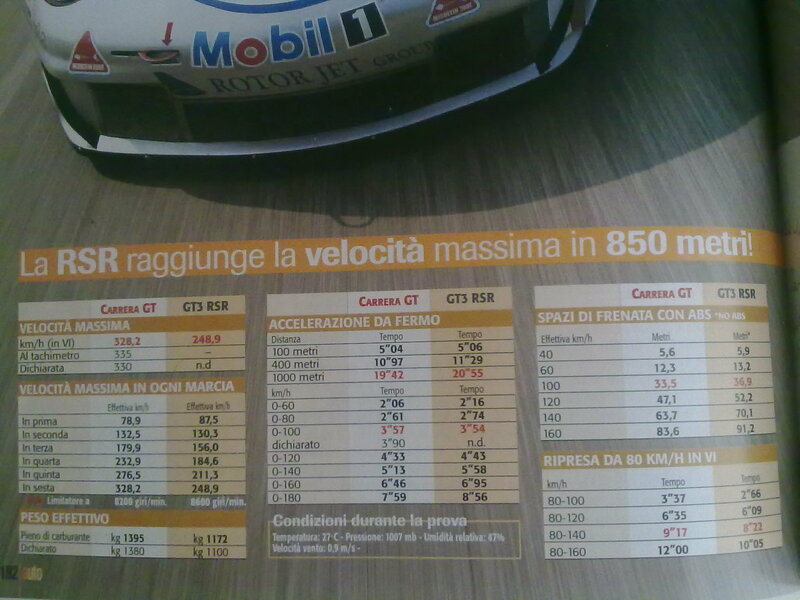 "2011-ferrari-458-italia-vs-2011-mclaren-mp4-12c-2011-porsche-911-gt2-rs-comparison-test-car-and-driver2011-ferrari-458-italia-vs-2012-mclaren-mp4-12c-2011-porsche-911-gt2-rs.pdf" (PDF). caranddriver.com. Retrieved 25 April 2016. ^ "MP4-12C_2012_Tech%20Spec_V6.pdf" (PDF). mclaren.com. Retrieved 25 April 2016. ^ Pund, Daniel (May 2015). "2016 Porsche 911 GT3 RS First Drive – Review – Car and Driver". caranddriver.com. Retrieved 13 April 2016. ^ "Porsche 911 GT3 RS - Technical Specs - Porsche Cars North America". porsche.com. Retrieved 13 April 2016. ^ a b Lingeman, Jake (30 October 2015). "2016 Ferrari 488 Spider review and road test with horsepower, price and photo gallery". autoweek.com. Retrieved 27 April 2016. ^ "Ferrari 488 GTB". ferrari.com. Retrieved 27 April 2016. ^ Stoklosa, Alexander (December 2017). "2018 Mercedes-AMG E63 S Sedan". Car and Driver. Retrieved 30 October 2018. ^ "Mercedes-AMG E63 S 4MATIC+". Mercedes-AMG. Retrieved 30 October 2018. ^ Robinson, Aaron (November 2014). "2015 Chevrolet Corvette Z06 Full Test – Review – Car and Driver". caranddriver.com. Retrieved 29 April 2016. ^ Wendler, Andrew (1 October 2015). "2015 Chevrolet Corvette Z06 0–60 and 1/4-Mile Times Announced! – Car and Driver | Car and Driver Blog". caranddriver.com. Retrieved 18 April 2016. ^ "Car and Driver: AMG GT S" (PDF). Car and Driver. Car and Driver. Retrieved 21 June 2016. ^ "2016 Mercedes-AMG GT S". Mercedes-Benz USA. Archived from the original on 17 June 2016. Retrieved 21 June 2016. ^ a b "2016 McLaren 675LT First Test Review". Motor Trend. Retrieved 7 April 2018. ^ Jonny Lieberman (3 March 2015). "2016 McLaren 675LT First Look". Motor Trend. Retrieved 7 April 2018. ^ "2018 Dodge Challenger SRT Demon: This Is It". Road & Track. 12 April 2017. Retrieved 13 September 2017. ^ "Dodge Challenger SRT Demon Reviews - Dodge Challenger SRT Demon Price, Photos, and Specs". Car and Driver. Retrieved 15 November 2017. ^ "Why the Dodge Challenger SRT Demon blurs NHRA's lines between street and strip". NHRA. Retrieved 7 April 2018. ^ Dodge Challenger (24 May 2017). "How to make your 2018 Dodge Challenger Demon NHRA-legal for drag racing". Autoweek.com. Retrieved 7 April 2018. ^ "2018 Dodge Challenger SRT Demon First Drive: Exercising Demons". Motor Trend. Retrieved 7 April 2018. ^ "Hyping Hypercars: 2014 Ferrari LaFerrari vs. 2014 McLaren P1, Lamborghini Veneno – Comparison Test – Car and Driver". ^ "2018 Performance Car of The Year". roadandtrack.com. November 2017. Retrieved 3 November 2017. ^ "Lamborghini Aventador LP750-4 SV laptimes, specs, performance data". FastestLaps.com. Retrieved 7 April 2018. ^ Sherman, Don (December 2015). "2016 Audi R8 V10 Plus - Instrumented Test". caranddriver.com. Retrieved 22 May 2016. ^ "Ferrari 458 Speciale: Race-inspired Design - Ferrari.com". ferrari.com. Retrieved 11 April 2016. ^ "CAR GRAPHIC 45th Anniversary Special Movie -ROAD GOING SPORTS- - YouTube". M.youtube.com. 16 July 2017. Retrieved 7 April 2018. ^ Walton, Chris (30 June 2018). "2019 Chevrolet Corvette ZR1 First Test: Out With a Bang". Motor Trend. ^ Lambert, Fred (8 August 2016). "Tesla Model S P90D with Ludicrous mode runs a quarter-mile in 10.8 seconds [Video]". electrek.co. Retrieved 8 August 2016. ^ "Stock 2008 Dodge Viper SRT10 Convertible runs 10′s". dragtimes.com. 24 March 2009. Retrieved 13 July 2014. ^ Robinson, Aaron (October 2012). "2013 Pagani Huayra First Drive – Review – Car and Driver". caranddriver.com. Retrieved 20 April 2016. ^ Davis, John (1 April 2016). "2016 McLaren 570S | MotorWeek". motorweek.org. Retrieved 2 May 2016. ^ "Brief performance details". Auto Magazine. November 2008. Archived from the original on 18 November 2015. Retrieved 24 August 2016.